You'll need to act quickly if you want this stamp set. Place an order over $50 and this set can be yours for only $5 but only until July 31. Here's another sample using this versatile stamp set, Reason to Smile. For this card, we used the rock and roll technique. Simply ink up the stamp in the lighter color and then holding the stamp over the darker color, roll it around so that only the edges are getting inked up with the new color. Here's another Moving Forward card. This was a prototype that after a little more tweaking, we did at last month's stamp-a-stack. With a post-it note placed over the words before inking up the stamp, you could make this a birthday card or really most anything else. Stampin' Up! has donated $1,000,000 to Ronald McDonald House Charities and your purchase of this stamp set on the last page of the catalog will add another $3. For each set purchased, Stampin' Up! will donate $3 to RMHC. This set is all purpose and one of my recent favorites. This card uses the Moving Forward stamp set, but the best part is that Stampin' Up! will donate $3 from every purchase to Ronald McDonald House Charities. As I mentioned earlier in the month, my next several scrapbook layouts for club just might be from my cruise. So here is page 1 and 2 of what is sure to be a big section of my scrapbook if not a scrapbook of its own. I really didn't know where to start so I did an overview page with the dates of my trip and some highlight photos. Luckily the ladies that come to club like to get a lot pictures on their pages so I can get away with a 10 picture layout. This punch just retired, but we went ahead and used it in stamp club because nearly everyone has this punch at home. But we did use a new stamp set that was just perfect for this card -Serene Silhouettes. I wanted to use my new Daydream Medallions stamp set and the coordinating Floral Frames Framelits. At first glance, this card is just a run of the mill card, but it's the interlocking opening that makes it fun. How's this for a surprise card? I loved the A Cherry on Top hostess set as soon as I saw the new catalog. Since this was a project on my to do list, I thought the treats on the cake plate would be perfect. I first saw on of these cards at our Spring into Stamping a few months ago. Here is Carol's tutorial. I had the entire card made when I stamped the words on the front and messed them up. The OCD in me came out, but I resisted the temptation to remake the entire card. This way I can show everyone what not to do, right? Here's one of our stamp club projects from last month. This diorama card stands up on it's own and would be great for any manly occasion. We used the old standby Lovely as a Tree, the new argyle embossing folder and also the new Itty Bitty Banners stamp set with matching embosslit. This Friends Fur-ever set was one of the recently retired stamp sets, but since my school mascot is a Scottie Dog, I wasn't able to part with it. (You might also guess our school colors are orange and black.) I made a few of these as thank yous at the end of the school year. I hope to sit down and make some more this summer and have them ready for next year! This card was made with the new Cheers stamp set. It doesn't show well in the picture, but I put Crystal Effects on the drink. The nice solid images are perfect for Crystal Effects and really make it look like there is something in the glass. I was trying to design this for the last stamp-a-stack and it just wasn't coming together like I wanted it to so I made one for me and did a different card for the group. You may have noticed the orange piece flaps up. It was my attempt at a different sort of fold. Don't worry, I will give it another try and you stamp-a-stack ladies will see this fold soon! Here's another Friday night Stamp-a-Stack card. 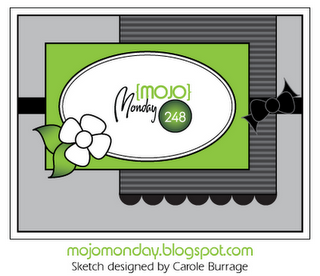 When I got ready to design cards, I went to Mojo Monday for some inspiration. As you can see, I didn't go with an oval shape in the center. I tried some different shapes but found that I liked the rectangle for the flowers. But that's what's fun about sketch challenges - everyone starts with the same idea and the cards all end up so different. I used the Reason to Smile stamp set that is available for $5 with a $50 order only in July. Here is my red, white and blue card for this Independence Day. We will be making this card on Friday at my July Stamp-a-Stack. It uses the cherries from the Mouthwatering stamp set and the new Delicate Doilies Sizzlit. I can't believe I never connected those words to one of my cherry stamps! I have several events coming up this month so I plan to get back to creating soon and will have some new posts for you with the new stamps that I barely had a chance to work with before I left!